The phrase, “eat your vegetables,” has long been used by stern-looking parents desperate to make their offspring eat something besides pasta and chicken fingers. To children everywhere, “vegetables” has meant mushy, bland tasting things that stand in the way of dessert. Unfortunately, many people carry the disdain for leafy, root-y edibles far into adulthood. 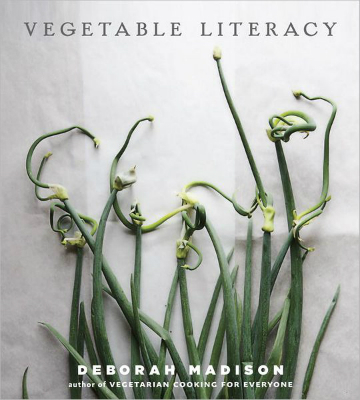 Vegetable Literacy by Deborah Madison may be the cookbook to change all of that. “Vegetable Literacy,” breaks new ground because it focuses on the relationships between the veggies that grow in your garden. Madison’s theory is that if you understand these relationships, you’ll find new freedom in the kitchen to mix and match flavors in away that allows zucchini, peas, squash, and so much more to harmonize their flavors instead of being tolerated like unwanted guests on your dinner plate. The author’s first clue that the world of vegetable relationships was a trove waiting to be revealed to home cooks came in the form of a second-year carrot gone to seed. The lacy umbel of its flower reminded of her parsley, fennel, cilantro, and even the wildflower Queen Anne’s lace. After a little investigation, it turned out they are all members of the same plant family, and its edible members share culinary characteristics. Her recommendation: peel away its thick skin, boil it to bring out its innate sweetness, and treat it lavishly. Smooth it with butter and cream; enhance its mild flavor with nutmeg, parsley, thyme, caraway, rosemary, and bay leaves. Add some smokiness in the form of smoked bacon, smoked salt, or smoked paprika. Or pair it with its sweeter cousins: potatoes, turnips, carrots, and apples. And that is just one vegetable’s treatment. Madison offers up more than 300 recipes to perceive vegetables in new ways. Once you understand their relationships, which vegetables needs coaxing from what flavors, you’ll transform a riot of awkward shapes into a symphony of tastes that delight. Essentially, instead of approaching vegetables with a whip and chair like a lion tamer, you become a conductor with a carrot as your baton. With Madison’s long career in restaurants, farmers’ markets, and the slow food movement, following her through “Vegetable Literacy” is a bit like trailing her through the vegetable patch, listening as she stoops to discover some new sprout poking beneath a sheltering leaf and sharing what she has learned over the years as her own garden and wisdom has matured. Even if you cook vegetables only once a week, you’ll learn something from this family tree encyclopedia told in Madison’s warm tone, sprinkled with funny stories. And she isn’t above disdaining vegetables either. After beautiful purple carrots turned to brown when cooked and thereby produced a mud-colored soup, down the drain it went. Madison knows our relationship to vegetables is tricky, and she aims to ease our comfort as best she can. With spring peeking around the corner, a recipe using spring peas is hard to resist (even if you swear you don’t like peas, give these a chance!). Check out Madison’s recipe for peas with baked ricotta and bread crumbs. It will make a lovely light supper for two – and maybe win over a new vegetable lover in the process. To read the recipe for peas with baked ricotta and bread crumbs, go to Stir It Up! on CSMonitor.com. Might have to check it out of the library first. Thanks for the review! That looks like an interesting cookbook. Thanks for the review.